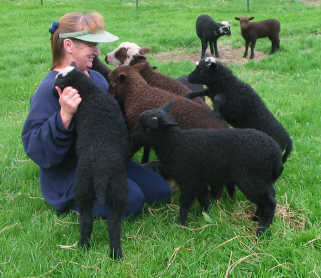 We were supposed to be headed for Oregon this week to attend Black Sheep Gathering in Eugene. But, with gas prices high and the nagging feelings I had about leaving our wonderful petsitter with way too many animals, both sheep and cats, plus my needing a dental crown next month to the tune of $850.00/copay, we started thinking about cancelling the trip. Hmm...I wonder if Shepherd's crooks come in child size? Congratulations Grandma (s) and Kelly! We will miss seeing you! T.
PS - looking thru some cookbooks the other day and anctually found a recipe for Golden Kiwis! Oh how wonderful for you and for your daughter. My mother and grandmother both had special names, and my daughter tried hard to coach her children to call me a special name, but in the end they call me Grandma. I absolutely love it. It's just as love as Mom! How wonderful for you and your family. It will be an exciting year for you.